● Do not drive with the trunk lid open. This could allow dangerous exhaust gases to be drawn into the vehicle. See “Exhaust gas” in the “Starting and driving” section of this manual. To open the trunk lid perform one of the following after unlocking all doors: ● Press the button on the instrument panel. ● Press the button on the Intelligent Key. ● Push the A release switch (if so equipped). To close the trunk lid, lower and push the trunk lid down securely. Request switches for all doors and trunk can be deactivated when the I-Key Door Lock setting is switched to OFF in the Vehicle Settings of the vehicle information display. 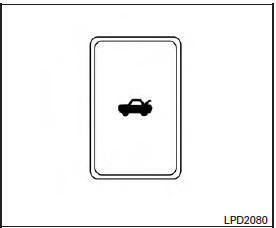 See “Vehicle information display” in the “Instruments and controls” section. When the switch, located inside the glove box, is in the OFF position, the power to the trunk lid will be cancelled. 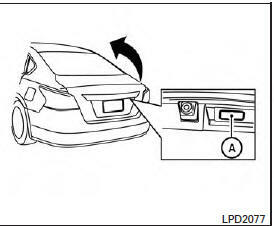 The trunk lid cannot be opened when: ● using the trunk lid release switch, ● the trunk open request switch (if so equipped) is pushed, when the Intelligent Key is in range of the vehicle or ● the HOLD button on the Intelligent Key is pressed.